One major challenge faced by virtual classroom facilitators is the absence of eye contact and body language that they usually rely on in the traditional classroom. Using surveys, polls and feedback tools in the virtual classroom can offset this lack of physical interaction. These tools help facilitators create engagement and determine whether participants understand the material. Participants can also use these tools to tell the facilitator what they think of the pace and clarity of the content. This video shows how to use surveys, polls and feedback tools to gauge interaction and engagement. For additional information, please download our complimentary whitepaper, Virtual Classroom Tool Design Basics: A Virtual Engagement Primer and review the blog post, Virtual Classroom Tool Design Basics: Surveys, Feedback & More! 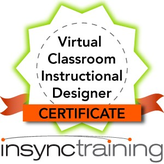 For hands-on instruction about surveys, polls and feedback tools, as well as many other virtual classroom tools, check out our Virtual Classroom Instructional Designer Certificate course by clicking on the title or the graphic below.